Chef” was taped, Jason Wang can finally tell his friends and family — after a dramatic pause, several commercial breaks, and another pause— he did not win. But if you’re wondering what it’s like to watch yourself on a reality TV show with everyone who matters to you, as Wang did Wednesday night at Pagu restaurant in Cambridge, “It’s just stressful,” said Wang, bouncing on the balls of his feet while his image was projected on a big screen overhead. 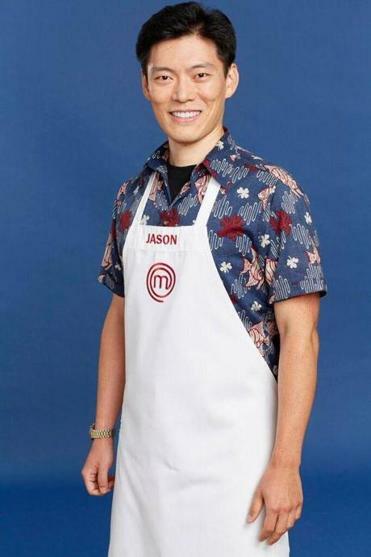 Appearing on a nationally televised cooking competition has a way of altering reality, but the Jason Wang who competed every week on Season 8 of “MasterChef” is pretty much the same 34-year-old guy who teaches music in Newton and has a career in classical music. Right down to those Hawaiian shirts he likes to wear. “All the different people I’ve met have given me artistic inspirations, so my food is everybody, really,” Wang told us during the watch party at Pagu. Over the course of the two-hour finale, the crowd of about 150 gasped and cheered. When, to the room’s dismay, Gordon Ramsay announced that Dino Angelo Luciano had won, Wang took the microphone and graciously thanked his guests. “You have all impacted who I am and the way I cook my food,” Wang said, overcome by emotion. The music teacher, who majored in plant science at Cornell, said the finale was a celebration of how far he’s come. “I tell my students ‘You have to give yourself a little credit, and even though you got a 98 percent, don’t focus on the 2 percent you got wrong, focus on the part you got right,’ ” said Wang, who’s trying to view his TV experience through the same lens. Wang used to work at Mimosa Boston, a florist in the South End, and he says the way he artfully arranged flowers helped him to thoughtfully plate his food. And the bowl that held the appetizer Wang prepared on Wednesday’s finale was also a reminder of home. Seventeen-year-old Jackson Fyfe made the bowls in a ceramics class at Newton South High School, where Wang teaches music. Wang was joined Wednesday night by some of his fellow “MasterChef” castmates, including Cate Meade, Yachecia Holston, Allston resident Necco Ceresani, Sam Reiff-Pasarew, and Somerville resident Danny Pontes-Macedo, who’d made it to the final eight. “When the competition is over, it’s just a bunch of people going through the same experience. You’re just trying to put out the best dish you can,” Pontes-Macedo said. So what’s next for the super talented Newton native? Wang said he’s going to continue teaching, perhaps even some culinary-arts courses.